Unfortunately, Booking Daughter and I had to miss this month's meeting because she was feeling a bit under the weather (but it did allow me to continue on my mission to take down some a wallpaper border!) I was pretty bummed because I absolutely loved AL CAPONE DOES MY SHIRTS by Gennifer Choldenko. Evidently, all of the girls and their moms loved it too (except for Booking Daughter) because they ended up talking about the book for over an hour! The girls are really coming into their own as far as book discussions go, and I see The Tweeny Bookworms just getting better and better! I don't know a lot of the details, but the girls did talk about Alcatraz. One of the moms even brought pictures from her visit to Alcatraz (a sightseeing tour, not an incarceration!) The girls also ended up talking about autism and the differences in the 1930s and present day. Our lovely hostesses for the meeting also had a surprise for the girls. Since she came up with our official name and logo a few months ago, she decided to have an ice cream cake made with them. Isn't it just too cute? Next month, we will be reading THE NAME OF THIS BOOK IS SECRET by Pseudonymous Bosch. I was expecting the May book to be A WRINKLE IN TIME so I was caught a bit off guard. I know next to nothing about this book except it is the first in a series, and everything surrounding the book seems quite mysterious. It looks like a very fun read for the girls. There is a very cool website devoted to the books as well as the author's blog. Let me know if you've read any of these books and what you think! Sorry Booking Daughter was under the weather. I bet she hates that she missed that gorgeous cake! 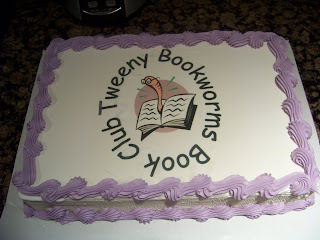 What a fun cake! Thanks for sharing. What a cute cake! This just seems like such a great bookclub! All of you are just way too cute! The cake and logo are a great idea and it looks tasty. 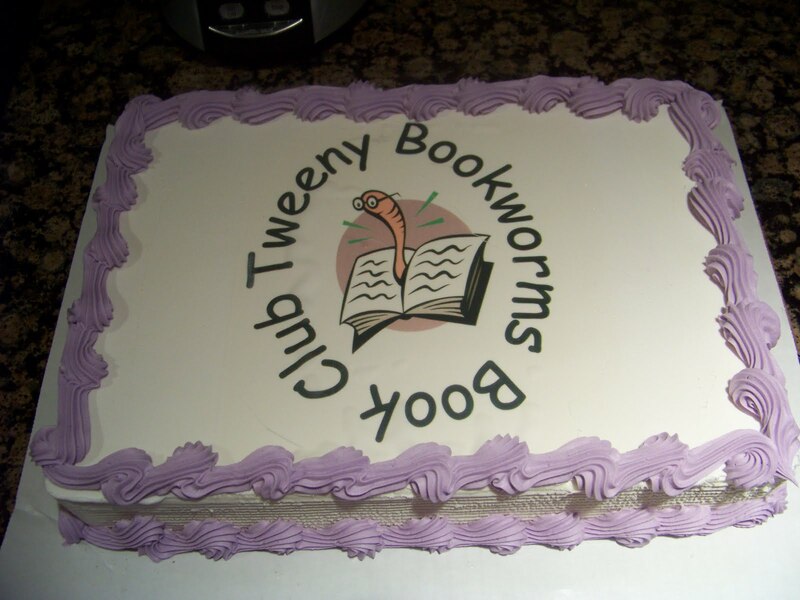 Sounds like a great book club event, cake and all. I love Al Capone Does My Shirts and the sequel that recently came out, Al Capone Shines My Shoes, is good too. Sorry you had to miss the meeting; hope your daughter is feeling better. Spring illnesses can sometimes linger. Sorry you had to miss the meeting, especially with that fun cake. I'm interested in the mysterious book, tho, so I'll be watching next month. I am really late to comment on this post, but I was wondering what age group this Tweeny Book Club is. I was trying to figure out if these books would be appropriate for my nine year old daughter. Yes. Our girls are anywhere between 9 and 11, so the books we are reading are appropriate for 9 year olds.